徐瑞深, 乜兰春, 王珊珊, 李潘, 王政, 王若男. 不同芹菜品种镉吸收和运转差异研究[J]. 植物营养与肥料学报, 2018, 24(5): 1321-1329. XU Rui-shen, NIE Lan-chun, WANG Shan-shan, LI Pan, WANG Zheng, WANG Ruo-nan. Differences of celery cultivars in cadmium absorption and accumulation[J]. Journal of Plant Nutrition and Fertilizers, 2018, 24(5): 1321-1329. Abstract: 【Objectives】 Crop cultivars are different in Cd absorption and up translocation. Studying the differences and the suitable index will support the selection of suitable cultivars, though which to minimize the Cd content and provide safe crop productions. 【Methods】 Ten celery cultivars were chosen as materials for a hydroponic culture experiment with substrates of vermiculite. 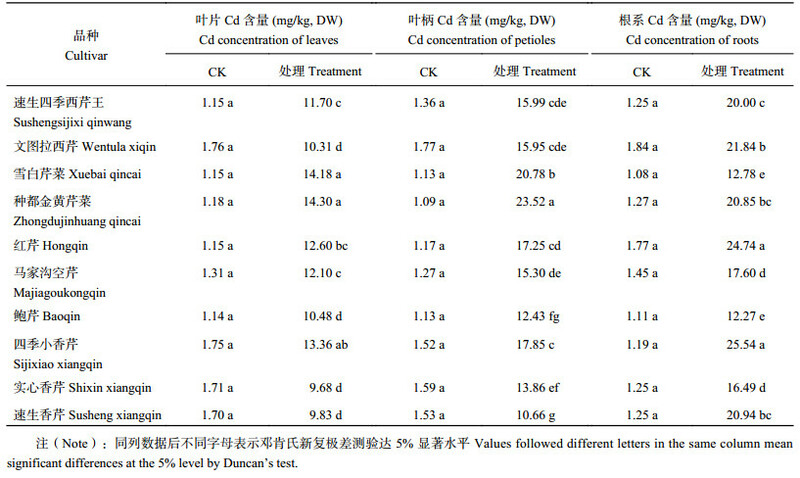 The 1/2 South China Agricultural University leafy nutrient solution was used as a control, and treatment solution containing 15 mg/L of cadmium chloride (CdCl2) were prepared at the base of control solution. 0.2 L of solution was watered every 3 days for each pot during 45 days’ growth of celeries, with a total input of Cd 45 mg/pot. The growth index and Cd content in roots, petioles and leaves of celeries were determined; the relative growth yield (RGY) and translocation factor (TF) was calculated, and celeries with different Cd-accumulation levels could be identified. The high- and low-Cd accumulation cultivars were selected and grown in plug trays. The seedlings were watered with the nutrient solution until 14 days, then watered with Cd-containing solution as before. After 21 days’ treatment, the Cd2+ flow rate in root meristem, elongation zone and root hair zone was determined using Non-invasive Micro-test Technology (NMT). 【Results】 The growth and Cd accumulation in shoots and roots of celeries were significantly different under the Cd stress. The for cultivar ‘Sushengsiji xiqinwang’, ‘Wentula xiqin’, ‘Siji xiaoxiangqin’, ‘Shixin xiangqin’ and ‘Xuebai qincai’, their root growth were significantly reduced but their shoots were not by Cd stress, and the shoot growth of ‘Siji xiao xiangqin’ was even promoted; For cultivar ‘Zhongdujinhuang qincai’, ‘Hongqin’ and ‘Baoqin’, in contrast, their shoot growth were significantly reduced but their roots were not by Cd stress; While for cultivar ‘Majiagou qincai’ and ‘Susheng xiangqin’, both the root and shoot growth significantly reduced by Cd stress. The Cd concentrations in leaf stalks, the edible organ, were higher in ‘Zhongdujinhuang qincai’ and ‘Xuebai qincai’, and those were lower in ‘Susheng xiangqin’ and ‘Shixin qincai’. The higher Cd concentration in leaf stalks represented higher capacity of Cd transportation. The Cd2+ flux rate in root hair zone of ‘Zhongdujinhuang qincai’ was greater than that of ‘Susheng xiangqin’. 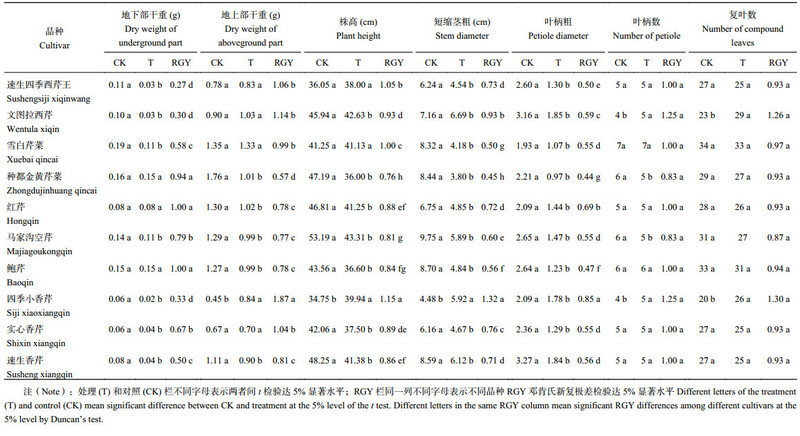 【Conclusions】 There are significant differences in growth, Cd absorption, transportation and accumulation among celery cultivars under Cd stress. ‘Sijixiao xiangqin’, ‘Sushengsijixi qinwang’, ‘Wentula qincai’, ‘Shixin xiangqin’ and ‘Xuebai qincai’ are tolerance cultivars, and ‘Zhongdujinhuang qincai’, ‘Hongqini’, ‘Baoqin’, ‘Majiagou qincai’ and ‘Susheng xiangqini’ are sensitive cultivars to Cd stress. ‘Xuebai qincai’ and ‘Zhongdujinhuang qincai’ are high Cd accumulation cultivars, where as ‘Shixin xiangqin’ and ‘Susheng xiangqin’ are low Cd accumulation ones. ‘Shixinxiangqin’ shows low Cd accumulation and high growth. Cultivars with high Cd concentration in shoots have strong capacities of Cd absorption in roots and transportation from roots to shoots. The Cd2+ flux rate in roots could be used to rapid screen low Cd transport and accumulation celery cultivars. 注（Note）：处理 (T) 和对照 (CK) 栏不同字母表示两者间t检验达 5% 显著水平；RGY栏同一列不同字母表示不同品种RGY邓肯氏新复极差检验达 5% 显著水平 Different letters of the treatment (T) and control (CK) mean significant difference between CK and treatment at the 5% level of the t test. Different letters in the same RGY column mean significant RGY differences among different cultivars at the 5% level by Duncan’s test. 注（Note）：同列数据后不同字母表示邓肯氏新复极差测验达 5% 显著水平 Values followed different letters in the same column mean significant differences at the 5% level by Duncan’s test. 肖旭峰, 解庆娓, 范淑英, 等. 镉、铅胁迫对芹菜生长及抗氧化酶活性的影响[J]. 江西农业大学学报, 2015, 37(5): 793–797. Xiao X F, Xie Q W, Fan S Y, et al. Effect of Cd, Pb stress on growth and the activity of antioxidant enzymes in Apium graveolens [J]. Acta Agriculturae Universitatis Jiangxiensis, 2015, 37(5): 793–797. 刘晓婷, 吕金印, 邸丽俊, 等. 改良剂对镉污染土壤芹菜生长及镉积累的影响[J]. 北方园艺, 2011, (15): 194–197. Liu X T, Lü J Y, Di L J, et al. Effects of modifiers on the growth and cadmium accumulation of celery in cadmium contaminated soil[J]. Norther Horticulture, 2011, (15): 194–197. 汤文光, 肖小平, 唐海明, 等. 长期不同耕作与秸秆还田对土壤养分库容及重金属Cd的影响[J]. 应用生态学报, 2015, 26(1): 168–176. Tang W G, Xiao X P, Tang H M, et al. Effects of long-term tillage and rice straw returning on soil nutrient pools and Cd concentration[J]. Chinese Journal of Applied Ecology, 2015, 26(1): 168–176. 张然然, 张鹏, 都韶婷. 镉毒害下植物氧化胁迫发生及其信号调控机制的研究进展[J]. 应用生态学报, 2016, 27(3): 981–992. Zhang R R, Zhang P, Du S T. Oxidative stress-related signals and their regulation under Cd stress: A review[J]. Chinese Journal of Applied Ecology, 2016, 27(3): 981–992. 杨阳, 李艳玲, 王美娥, 等. 湖南攸县稻米镉(Cd)富集特征及原因解析[J]. 环境科学学报, 2017, 34(4): 1502–1507. Yang Y, Li Y L, Wang M E, et al. Enrichment characteristics of cadmium in rice and its influence factor in the Youxian prefecture, Hunan Province[J]. Acta Scientiae Circumstantiae, 2017, 34(4): 1502–1507. 胡博华, 徐劼, 段德超, 等. 镉胁迫下芹菜生理响应的傅里叶变换红外光谱研究[J]. 北方园艺, 2015, (15): 11–16. Hu B H, Xu J, Duan D C, et al. Physiological response of celery (Apium graveolens L.) to cadmium stress by FTIR spectroscopy [J]. Northern Horticulture, 2015, (15): 11–16. 杨阳, 王美娥, 李艳玲, 等. 基于转移方程的蔬菜镉累积预测和土壤风险阈值推导[J]. 应用生态学报, 2017, 28(2): 603–608. Yang Y, Wang M E, Li Y L, et al. Prediction of Cd in vegetables and soil Cd threshold derivation based on transfer function[J]. Chinese Journal of Applied Ecology, 2017, 28(2): 603–608. 韩立娜, 居学海, 张长波, 等. 水稻镉离子流速的基因型差异及其与镉积累量的关系研究[J]. 农业环境科学学报, 2014, 33(1): 37–42. Han L N, Ju X H, Zhang C B, et al. Genotypic variation of Cd2+ flux and its relationship with Cd accumulation in rice plant [J]. Journal of Agro-Environment Science, 2014, 33(1): 37–42. 顾翠花, 王懿祥, 白尚斌, 等. 四种园林植物对土壤镉污染的耐受性[J]. 生态学报, 2015, 35(8): 2536–2544. Gu C H, Wang Y X, Bai S B, et al. Tolerance and accumulation of four ornamental species seedlings to soil cadmium contamination[J]. Acta Ecologica Sinica, 2015, 35(8): 2536–2544. 李晓婧, 郑向群, 郑顺安. 叶菜对Cd的富集特征及敏感性分布[J]. 环境科学研究, 2017, 30(5): 720–727. Li X J, Zheng X Q, Zheng S A. Accumulation and sensitivity distribution of cadmium in leafy vegetables[J]. Research of Environmental Sciences, 2017, 30(5): 720–727. 吴彬艳, 邵冰洁, 赵惠恩, 等. 11种广义景天属植物对Cd的耐性和积累特性[J]. 环境科学学报, 2017, 37(5): 1947–1956. Wu B Y, Shao B J, Zhao H E, et al. Cd accumulation and tolerance characteristics of 11 species in Sedum sensu lato [J]. Acta Scientiae Circumstantiae, 2017, 37(5): 1947–1956. 唐皓, 李廷轩, 张锡洲, 等. 水稻镉高积累材料不同生育期镉积累变化特征研究[J]. 农业环境科学学报, 2015, 34(3): 471–477. Tang H, Li T X, Zhang X Z, et al. Cadmium accumulation in high cadmium-accumulating rice cultivars at different growth stages[J]. Journal of Agro-Environment Science, 2015, 34(3): 471–477. 陈瑛, 李廷强, 杨肖娥. 镉对不同基因型小白菜根系生长特性的影响[J]. 植物营养与肥料学报, 2009, 15(1): 170–176. 陈瑛, 李廷强, 杨肖娥, 等. 不同品种小白菜对镉的吸收积累差异[J]. 应用生态学报, 2009, 20(3): 736–740. Chen Y, Li T Q, Yang X E, et al. Differences in cadmium absorption and accumulation of Brassica varieties on cadmium-polluted soil [J]. Chinese Journal of Applied Ecology, 2009, 20(3): 736–740. Xiao Q, Ming H W, Huang L, et al. Effects of cultivars and water management on cadmium accumulation in water spinach (Ipomoea aquatica Forsk.) [J]. Plant & Soil, 2015, 391(1-2): 33–49. Hartke S, Da S A, de Moraes M G. Cadmium accumulation in tomato cultivars and its effect on expression of metal transport-related genes[J]. Bulletin of Environmental Contamination & Toxicology, 2013, 90(2): 227–232. 赵首萍, 张永志, 张棋, 等. 两种基因型番茄对镉胁迫响应差异[J]. 植物营养与肥料学报, 2015, 21(5): 1261–1268. Zhao S P, Zhang Y Z, Zhang Q, et al. Differential responses of two tomato cultivars to cadmium stress[J]. Journal of Plant Nutrition and Fertilizer, 2015, 21(5): 1261–1268. 迟克宇, 范洪黎. 不同积累型苋菜(Amaranthus mangostanus L.)镉吸收转运特征差异性研究 [J]. 植物营养与肥料学报, 2016, 22(6): 1612–1619. Chi K Y, Fan H L. Characteristics of Cd uptake and translocation in two cultivars of amaranth (Amaranthus mangostanus L.) [J]. Journal of Plant Nutrition and Fertilizer,, 2016, 22(6): 1612–1619. 肖旭峰, 解庆娓, 蔡玲, 等. 芹菜对镉、铅胁迫的生理响应及抗氧化酶基因表达特性分析[J]. 核农学报, 2017, 31(9): 1864–1871. Xiao X F, Xie Q W, Cai L, et al. Physiological responses to Cd, Pb pollution and expression analysis of antioxidative genes in celery[J]. Journal of Nuclear Agricultural Sciences, 2017, 31(9): 1864–1871. Ezawa T, Smith E L, Smith F A. P metabolism and transport in AM fungi[J]. Plant and Soil, 2002, 244(1-2): 221–230. Liu J G, Qu P, Zhang W, et al. Variations among rice cultivars in subcellular distribution of Cd: The relationship between translocation and grain accumulation[J]. Environmental & Experimental Botany, 2014, 107(6): 25–31. Xin J, Huang B, Dai H, et al. Characterization of cadmium uptake, translocation, and distribution in young seedlings of two hot pepper cultivars that differ in fruit cadmium concentration[J]. Environmental Science & Pollution Research International, 2014, 21(12): 7449–7456. Wang Z, Nan Z, Zhao Z, et al. Effects of cadmium, zinc and nickel on celery growth and bioaccumulation of heavy metals in contaminated arid oasis soils[J]. Journal of Arid Land Resources & Environment, 2011, 25(2): 138–143.